*Present address, Lucent Technologies, Holmdel, N.J. 07733-3030. †Present address, Tellium Inc., Oceanport, N.J. 07757-0901. We report studies of second-harmonic generation (SHG) of femtosecond pulses in long periodically poled lithium niobate waveguides under large conversion conditions. Strong saturation of the SHG efficiency was observed, accompanied by spectral and temporal distortion of the pump pulse. Our simulation studies suggest that the pulse distortions may be caused by the interaction of the phase-matched SHG process and an additional cascaded χ(2) process or processes, leading to a large nonlinear phase modulation. Such additional cascaded χ(2) processes could be caused by the existence of multiple transverse modes in the nonlinear waveguide. 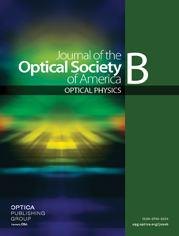 These phenomena, which to our knowledge have not been reported previously, may have a significant effect on studies of high-power short-pulse parametric process in waveguide devices and on the design of novel nonlinear optical waveguide devices for such applications.